The Kenneth Branagh Theatre Company’s inaugural season plays Shakespeare’s “The Winter’s Tale” in London’s Garrick Theatre, a little jeweled box of candy. The heavy, dark red curtain rose on a wintry scene – a sparse set given warmth by the Victorian Christmas tree surrounded by wrapped gifts and eventually members of a happy court. As always, no one addresses God in Shakespeare, but Apollo is the god they pray to, and who freely shows his displeasure when disrespected. As ever, kudos to Christopher Oram for his thoughtful scenic and costume designs, as well as Neil Austin‘s beautiful lighting design. Christopher Shutt’s sound design seemed to stutter a bit in the opening moments when the actors appeared to be in overly full voice and far from subtle. Within a few moments, however, the sound evened out and was thereafter so well done that one did not note it. Happily, the Garrick Theatre has a proscenium stage. Some readers may recall that the last time I reviewed something directed by Kenneth Branagh I was rather annoyed with him and his co-director/ choreographer Rob Ashford. [If you’ve forgotten, see http://www.mollyismusing.blogspot.com/2014/06/sound-only-signifying-nothing-or.html]. 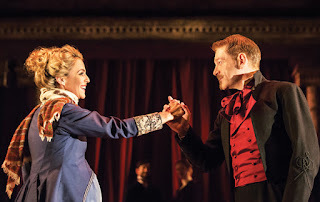 The advantage of a proscenium stage production is that Messrs. Branagh and Ashford can actually stage the play so that everyone in the auditorium can see everybody on stage. Nice. With regard to Mr. Branagh the actor, I must say that this is the first time (of three or four) I’ve seen “The Winter’s Tale” and given a damn about Leontes. Every time that horrible man is unforgiveable, which makes the final sappy scene unbearable. Kenneth Branagh is such a good actor that he delved into the man and found his heart and showed it to us. Well done. 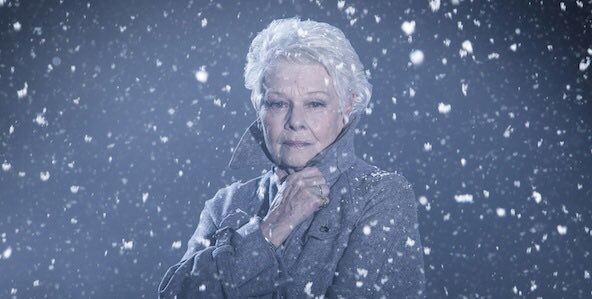 Dame Judi Dench in The Winter's Tale. Dame Judi Dench is a powerful Paulina, here immediately introduced as an intimate of the family playing with the King’s son Mamillius (in a scene not penned by Shakespeare). While Paulina is usually the same generation as Leontes, here she’s clearly a friend of his granny’s. This is not a complaint: Judi Dench can do anything as far as I’m concerned. It’s just not how I generally think of Paulina, since everyone in the play ages 16 years between Acts I and IV. Except those who die, of course. Michael Pennington does fine comedic work as Paulina’s beleaguered husband Antigonus, loyal to his king and to his princess to the very last. Miranda Raison is a serene, confident and loving Hermione, well matched to Branagh’s Leontes. In the opening scenes we see a convivial gathering of Leontes’ court, to which his childhood friend Polixenes, King of Bohemia, has been visitor for almost 9 months. Hadley Fraser’s wide-ranging portrayal of Bohemia in the opening to a man some years older in the latter part of the play was always on the mark. We also meet Camillo, Leontes’ loyal subject who is too good to do his king’s bidding. John Shrapnel portrays the conscience of both kings he serves excellently. John Colgrave Hirst was a very tall, very funny Clown, Tom Bateman a fine Florizel, the young prince in love with the shepherdess Perdita, who is charmingly played by Jessie Buckley. There were no sour notes in this cast, and I wish I were in London to see the entire season played by this company. Extra: During the intermission (a.k.a. the Interval) Rob Brydon spoke “The Shakespeare Poem” by Bernard Levin to illustrate how often in our daily discourse we quote Shakespeare. Delightful. My one gripe was not with the production itself but rather the filming of the production. The “cinema broadcast” was directed by Benjamin Caron, who has also worked with Mr. Branagh on the PBS series Wallander. Clearly he likes to photograph Mr. Branagh, unfortunately to the detriment of the production, Ms. Dench, Mr. Shrapnel, and the audience. We want to see Paulina when she is haranguing Leontes, not only Leontes’ reaction. Reactions are important and Mr. Branagh does them very well, but widen the shot. We want to see Camillo as we hear him plead with Leontes, not merely Leontes’ reaction. Widen the shot. Show us the excellent staging by Branagh and Ashford. This is not television. The “film” of the play aside, this was a fine production of a difficult play, and I look forward to more from this company. ~ Molly Matera signing off and belatedly wishing you all a Happy, Healthy New Year.